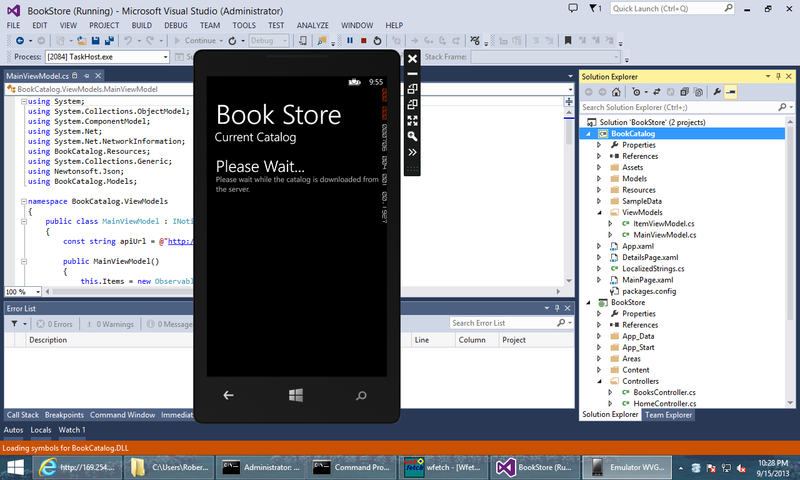 In this tutorial, you will learn how to create a complete end-to-end scenario consisting of an ASP.NET Web API application that provides a catalog of books to a Windows Phone 8 application. RESTful services like ASP.NET Web API simplify the creation of HTTP-based applications for developers by abstracting the architecture for server-side and client-side applications. Instead of creating a proprietary socket-based protocol for communication, Web API developers simply need to publish the requisite HTTP methods for their application, (for example: GET, POST, PUT, DELETE), and client application developers only need to consume the HTTP methods that are necessary for their application. 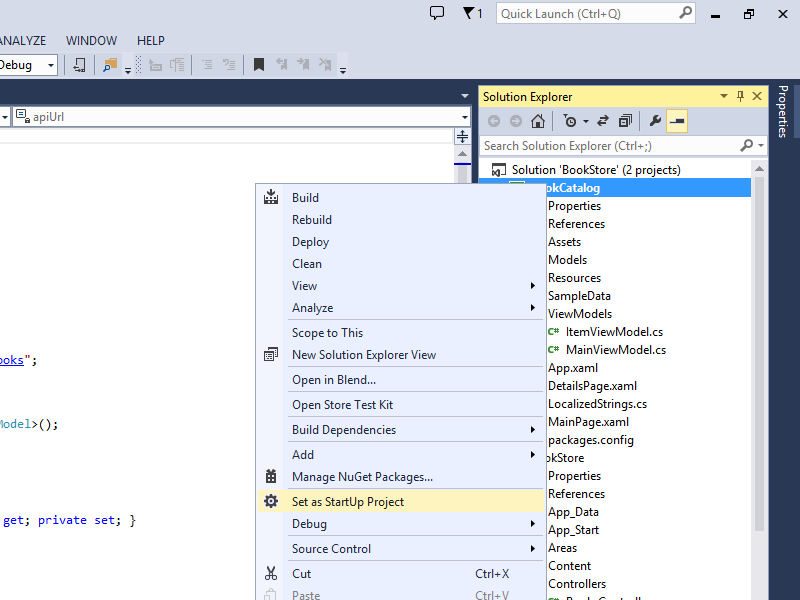 In the first part of this tutorial, you will create an ASP.NET Web API application that supports all of the Create, Read, Update, and Delete (CRUD) operations to manage a book catalog. This application will use the Sample XML File (books.xml) from MSDN. In the second part of this tutorial, you will create an interactive Windows Phone 8 application that retrieves the data from your Web API application. For a list of additional requirements, see the System Requirements section on the Windows Phone SDK 8.0 download page. If you are going to test the connectivity between Web API and Windows Phone 8 projects on your local system, you will need to follow the instructions in the Connecting the Windows Phone 8 Emulator to Web API Applications on a Local Computer article to set up your testing environment. The first step of this end-to-end tutorial is to create a Web API project that supports all of the CRUD operations; note that you will add the Windows Phone application project to this solution in Step 2 of this tutorial. Click File, then New, and then Project. When the New Project dialog box is displayed, expand Installed, then Templates, then Visual C#, and then Web. 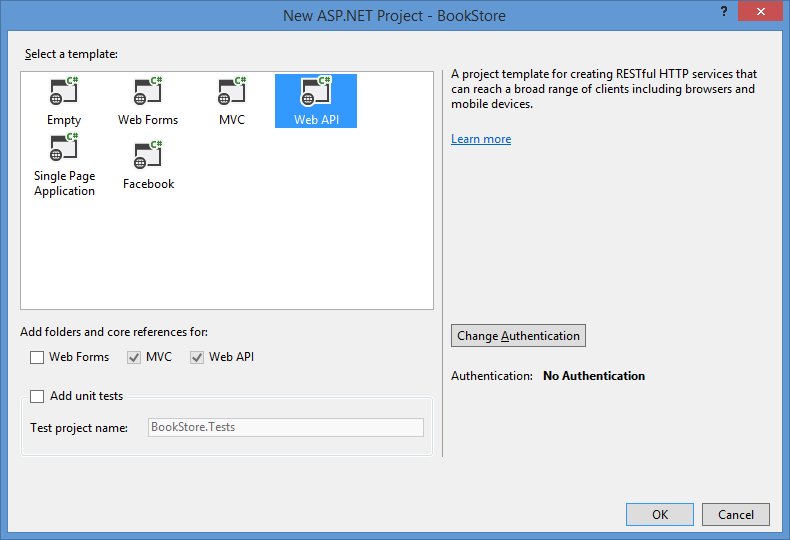 Highlight ASP.NET Web Application, enter BookStore for the project name, and then click OK. 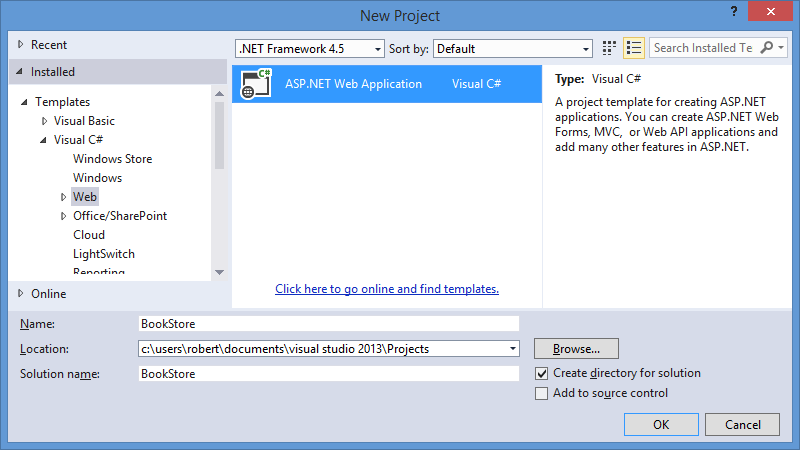 When the New ASP.NET Project dialog box is displayed, select the Web API template, and then click OK. Expand the Controllers folder in the solution explorer. Right-click the ValuesController.cs file, and then click Delete. Right-click the App_Data folder in the solution explorer, then click Add, and then click New Item. When the Add New Item dialog box is displayed, highlight the XML File template. Name the file Books.xml, and then click Add. conference, tempers fly as feathers get ruffled. thousand leagues beneath the sea. centipedes, scorpions  and other insects. detail in this deep programmer's reference. Right-click the Models folder in the solution explorer, then click Add, and then click Class. When the Add New Item dialog box is displayed, name the class file BookDetails.cs, and then click Add. /// Define a class that will hold the detailed information for a book. /// Define an interface which contains the methods for the book repository. /// Define a class based on the book repository interface which contains the method implementations. /// Define the class constructor. // Determine the path to the books.xml file. // Load the contents of the books.xml file into an XDocument object. /// Method to add a new book to the catalog. /// Defines the implementation of the POST method. // Retrieve the book with the highest ID from the catalog. // Extract the ID from the book data. // Create an ID for the new book. // Verify that this book ID does not currently exist. // Retrieve the parent element for the book catalog. // Create elements for each of the book's data items. // Add the element to the book element. // Append the new book to the XML document. // Return an object for the newly-added book. // Return null to signify failure. /// Method to retrieve all of the books in the catalog. /// Defines the implementation of the non-specific GET method. // Return a list that contains the catalog of book ids/titles. // Query the catalog of books. // Sort the catalog based on book IDs. // Create a new instance of the detailed book information class. // Populate the class with data from each of the book's elements. /// Method to retrieve a specific book from the catalog. /// Defines the implementation of the ID-specific GET method. // Retrieve a specific book from the catalog. // Specify the specific book ID to query. /// Populates a book BookDetails class with the data for a book. /// Method to update an existing book in the catalog. /// Defines the implementation of the PUT method. // Verify that the book exists. // Return an object for the updated book. /// Method to remove an existing book from the catalog. /// Defines the implementation of the DELETE method. // Remove the specific child node from the catalog. // Return a failure status. Save and close the BookDetails.cs file. Right-click the Controllers folder in the solution explorer, then click Add, and then click Controller. When the Add Scaffold dialog box is displayed, highlight Web API 2 Controller - Empty, and then click Add. When the Add Controller dialog box is displayed, name the controller BooksController, and then click Add. Save and close the BooksController.cs file. Build the Web API application to check for errors. The next step of this end-to-end scenario is to create the catalog application for Windows Phone 8. This application will use the Windows Phone Databound App template for the default user interface, and it will use the Web API application that you created in Step 1 of this tutorial as the data source. Right-click the BookStore solution in the in the solution explorer, then click Add, and then New Project. When the New Project dialog box is displayed, expand Installed, then Visual C#, and then Windows Phone. Highlight Windows Phone Databound App, enter BookCatalog for the name, and then click OK.
Right-click References for the BookCatalog project in the solution explorer, and then click Manage NuGet Packages. When the Manage NuGet Packages dialog box is displayed, expand the Online section, and highlight nuget.org. Enter Json.NET in the search field and click the search icon. Highlight Json.NET in the search results, and then click Install. Right-click the BookCatalog project in the solution explorer, then click Add, and then click New Folder. Name the new folder Models. Expand the ViewModels folder in the solution explorer, and then double-click the MainViewModel.cs file. Save and close the MainViewModel.cs file. Double-click the MainPage.xaml file in the solution explorer. Save and close the MainPage.xaml file. Double-click the DetailsPage.xaml file in the solution explorer. Save and close the DetailsPage.xaml file. 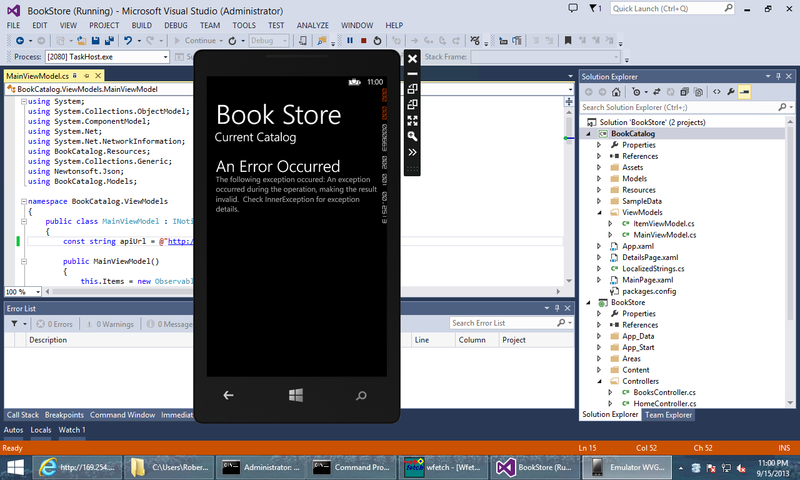 Build the Windows Phone application to check for errors. As mentioned in the Prerequisites section of this tutorial, when you are testing the connectivity between Web API and Windows Phone 8 projects on your local system, you will need to follow the instructions in the Connecting the Windows Phone 8 Emulator to Web API Applications on a Local Computer article to set up your testing environment.